Recent reports have it that the Duchess of Sussex, Meghan Markle is adopting a child from an impoverished part of the world, just so she can be like Princess Diana, Madonna, and Angelina Jolie.Apparently, Gossip Cop has investigated these reports and findings reveal that neither is the duchess planning an adoption right now, nor is she trying to be like any of the above mentioned celebrities. The false news started making rounds after the National Enquirerfirst published a story which said that Markle wants to become the “first royal to adopt.” They also wrote that the Duchess specifically wanted to adopt a kid from a third world country, not because she was compassionate to the plight of these kids, but because she wanted to be perceived as a modern day version of princes Diana who devoted herself to the plight of poor and sick children. 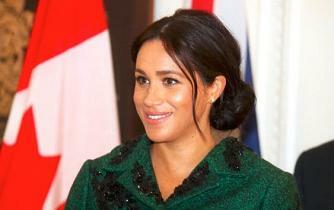 The tale bearers insisted that they had been tipped off by an unnamed informant who said that Markle wanted to copy Madonna and Jolie, who have children from Africa and Asia, “by adopting [to] give disadvantaged kids a great life.” The informant is said to have warned that if Markle goes ahead with the adoption, it could backfire and alienate her from other members of the royal family. Gossip Cop claims this report is all fake, accusing the Enquirer of publishing the same tale exactly one year ago. They said The Globe, ran a cover story last year that went a little further, maintaining Markle and Prince Harry had already adopted an “African baby.” In that story, they had quoted an unidentified tipster who said the royals want to “have a rainbow family like Angelina Jolie.” Gossip Cop says the Enquirer had only included Princess Diana and Madonna in the current article to make the latest report appear new and different. After last year’s publication of the same news, Gossip Cop had reached out to Kensington Palace about adoption plans, and the royals had laughed it off. This year, the royal household refused to officially comment on the story, because of protocol, but it dismissed the magazine’s article as nothing more that speculation. The Enquirer has in the past published a lot of news about the Duke and Duchess of Sussex, which never came to pass. Last June, for instance, they falsely wrote that Prince Harry and Markle were fighting and their marriage was threatened, this was just a month after exchanging vows. However this is nearly one year later and the couple are still together and are even about to welcome a baby. All this is not at all surprising as in the two years since her relationship with Prince Harry went public, Meghan Markle has had to deal with countless tabloid rumors. There have been rumors about her relationship with Harry, her family and the royal family. The duchess has been known to typically ignore this rumour just as she’s ignoring these latest ones.